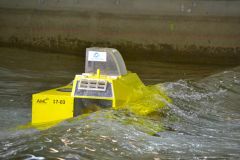 A new wave energy device tested at the Australian Maritime College is now heading for commercial application in Australia’s Bass Strait. AMC worked with developer Wave Swell Energy to test the performance of the device and found it was at least 120% more efficient than a conventional device. Wave Swell have now announced plans to build a commercial-sized plant to provide power to King Island, halfway between Tasmania and Victoria. "Wave Swell Energy could not be happier with the results obtained by AMC during the testing of the company's wave energy technology," Dr Denniss said. "Wave Swell Energy could not be happier with the results obtained by AMC during the testing of the company's wave energy technology. “The results indicate the technology is ready to assume its place as part of the world's commercial energy generation mix, with a strong potential to be among the very lowest cost sources of power within a few years." Wave Swell Energy’s design is a concrete gravity structure that sits on the seabed in 10m of water. It is based on the oscillating water column concept, which acts like an artificial blowhole with water rising and falling inside a chamber. Wave Swell have introduced novel vents that allow the air to escape from the chamber as a wave enters. The vents then close and as the wave passes, it draws air through the turbine. This has two significant advantages: the venting of the chamber as the wave enters greatly reduces damping, meaning more water enters the chamber – resulting in an increase in efficiency. More significantly, it means that a simpler, more robust and efficient unidirectional turbine can be used, rather than a bi-directional turbine used by conventional wave energy converters of this type. The tests performed at AMC have provided proof-of-concept for these novel improvements. Associate Professor Gregor Macfarlane, who led the research at AMC, explains that the research team carried out extensive testing that helped optimise the turbine. "With advanced measurement techniques using laser diagnostics, we looked very closely at how water flows in and out of the chamber. This allowed us to modify the geometry of the device to make further significant improvements in efficiency,” Professor Macfarlane said. The AMC team also performed numerous experiments in extreme weather conditions to measure the loads experienced by the concrete structure; this information has been used by the structural engineers to ensure the concrete device will withstand all the Southern Ocean can throw at it over a 25-year period. Wave Swell’s series of one-megawatt generators will cost up to $7 million to build and at peak times will provide up to half the power for King Island’s 1,600 residents. They expect the cost of wave power to be less than 10 cents per kilowatt hour when built at scale, which is comparable with new hi-tech forms of coal power.